Painting it Black- ‘Deepwater Horizon: Tankers in Distress’ by artist © Tom Estes is a remastered work based on a work from the Tate Collection. This interventionist work was created for BP Loud Tate 2014: Code and clearly makes reference to the Deepwater Horizon oil spill. Though the suggestion might sound absurd or even ridiculous, can you imagine advertising being plastered all over a work of art? Sponsorships, perhaps, stuck discreetly to a corner of a canvas? Yet advertising and corporate influence through Sponsorship present an increasingly fundamental part of art world financial support and is therefore a concern for art and artists. 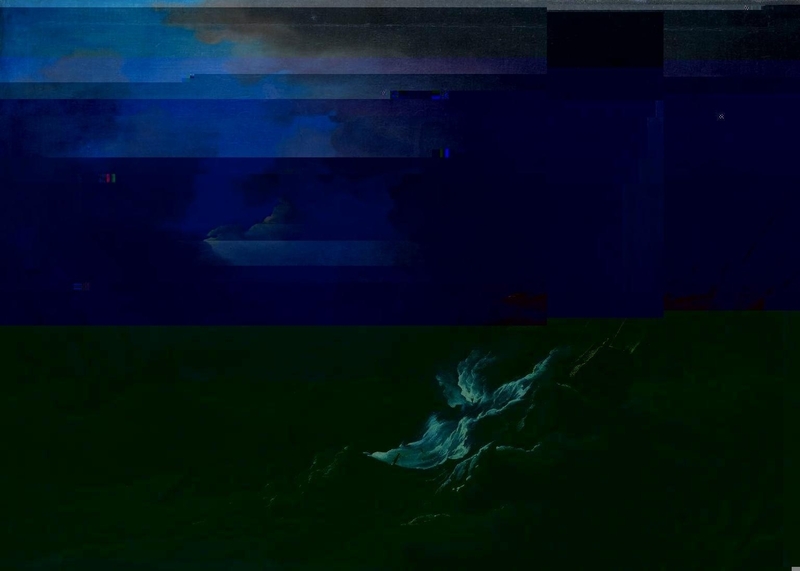 BP Loud Tate: Code is based around Glitch Art which is the aestheticization of digital or analog errors, such as artifacts and other “bugs”, by either corrupting digital code/data or by physically manipulating electronic devices. BP Loud Tate 2014: Code is one of many events at the Tate that seems to be plastered with the logo of British Petroleum- the budding flower prominently displayed alongside “celebrating 25 years of the The BP and Tate partnership”. However, this particular company sponsorship is raising some eyebrows. Concerns are increasingly taken up by prominent culture industry figures about the impact of climate change- and the role sponsorship plays in cleaning up the image of dirty industries. Tobacco, weapons and gambling companies have been blacklisted by the art world, and some protesters, many of them artists, would like BP and Shell to be treated in much the same way. For example, after the companies role in oil gushing into the Gulf of Mexico some artist have taken to redesigning the BP logo of a ‘flower in bloom’. Organisations such as Liberate Tate aim to “free art from oil” with a primary focus on the Tate ending its corporate sponsorship with BP. Liberate Tate has become internationally renowned for artworks about the relationship of public cultural institutions with oil companies. Earlier this year, a workshop at the Royal Court theatre, hosted by artistic director Vicky Featherstone and attended by playwrights Caryl Churchill and Mark Ravenhill, heard presentations about the environmental impact of energy companies – and discussed moving towards “fossil-free theatre”. Sponsorship is big business. The Fédération Internationale de Football Association has made as much as $1.4 billion from sponsorship deals with 20 major companies during the World Cup in Brazil. That’s 10 percent more sponsorship revenue than from the last World Cup, in South Africa. Although significant, that’s still far below US corporate spending on sports sponsorships, which grew to an estimated $20 billion in 2013—equal to one-third of total US television advertising and one-half of digital advertising. However, the Tate are currently fighting to keep the details of this sponsorship deal secret. The fight over information, although linked to this anti-oil activism, is different. Not all those who support calls for transparency are against oil sponsorship; they just want to know more about it. To manage sponsorship spending effectively, advertisers must first articulate a clear sponsorship strategy—the overall objective of their portfolio, the target demographic, and which stages of the consumer decision journey (awareness, consideration, purchase, loyalty) sponsorships can support. Considering the nature of art and the huge amounts of money involved, you would imagine the Tate would have clear answers about the role of BP in sponsoring them. When interviewed last year, artist and former Tate trustee Jeremy Deller defended the museum’s position, arguing that BP has no influence over the collection, and that “art has always had connections to power”. We know that corporate sponsorships are not just big gifts. They come with firmly attached strings – promotional and corporate entertainment opportunities – and the promise of a benefit to the sponsor. But the impact on the institution and the artists who work there remains a mystery. Is privately sponsored art different from the publicly funded variety? For example, The University of Wyoming removed “Carbon Sink,” by Chris Drury, after receiving oil complaints from the oil industry. Commissioned by the University of Wyoming to create an installation in 2011, he made Carbon Sink, which placed logs gnawed by pine bark beetles in a whirlpool-pattern on a pristine lawn. The piece was intended as a comment on global warming and Wyoming’s hugely powerful coal industry: the winters are no longer cold enough to kill the beetles, and trees are dying as a result. In his essay “Marx, Labor, and the Artist,” poet and critic Reginald Sheperd defines the artist as a “cultural worker in the same way that someone laboring in a factory is an industrial worker.” But for Sheperd, artists are more independent and self-actualized than the oppressed industrial worker because the artist chooses “both the means and the result of his own production” and “both the impulse and the product of his labor are his own.” Factory workers control neither the means nor the results of their production; they are simply labor. So perhaps in a contemporary art world, which is increasingly market led and heavily reliant on corporate support, the only means forward is to recognize the glitches in the system and to make them transparent. The art of the Glitch, like most New Media Art started out as a fringe art scene mainly showing work for free on the internet. However, what started out mainly outside the gallery and museum system has matured into a thriving art practice along with digital culture at large. New Media Art in it´s production, distribution, and valuation, operates in a moment that is distinctly post-internet- having reached a point of saturation so that even the prefix ´New´has become some what unnecessary. However the internet is now a mass market, a negatively democratized space in which art, like any other media good, is simply fodder for the monetization mill. In the eyes of the companies that control the networks, the most successful piece of social media art is barely different from status updates. While Digital artists might subvert some of the polite intentions and norms of social networks, they don’t overthrow their capitalist infrastructure. And even these works can’t escape becoming monetized in the form of advertising and data sales through the social networks they exist on.